I'm Briony an Australian girl who loves all things beauty. This blog is a way to justify and share my addiction to the world. 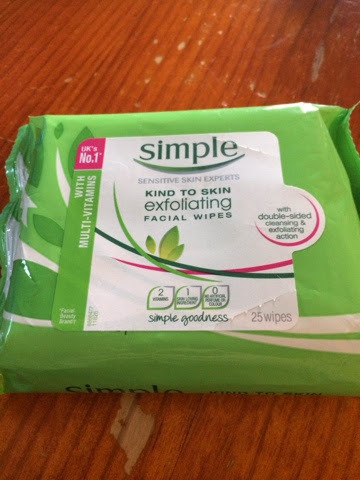 Simple Kind to Skin Exfoliating Facial Wipes are this weeks focus! I have already focused on Simple twice before here and here. These wipes however are completely different to the other two. They are exfoliating wipes and I believe that they do just that. One side of the makeup wipe is smooth while the other side has small exfoliating groves in the wipe. It's good at removing makeup while also giving a nice smoothness to the skin. I like to use these a few times a week to make sure my skin is nice and smooth if I don't feel like using my Micheal Todd face mask. I think if your skin is feeling crap and needs a perk up this are really useful, to make your skin as well as foundation look better. There is nothing worse than dry flaky and bumpy skin making your foundation look bad. Would I recommend this? Yes! Will I repurchase them? Yes I will. I am more than willing to pay full price for them as well but I'm sure I will stock up when they are one sale!